This slim volume is an excellent read for the young adult. It reminds me strongly of Henlein’s ‘juvenilia’. Theodora Baumgartner is a teenager who suddenly finds herself an unwilling space cadet and this short story unfolds from there. It rolls along at a good pace and I found myself eating it up in a single sitting. I’m certainly going to read a little more of Willis’s work after this. Since this was a birthday gift I’m not going to complain about a single short story in a hardcover edition. The Lego Mindstorms NXT Zoo! Animals have taken over my house. Every time I turn around something is hopping, walking or skittering across the floor. I blame No Starch Press and the LEGO company; a NXT MindStorms kit and a copy of “The LEGO NXT Mindstorms Zoo” (“Zoo”) by Fay Rhodes has my 15 year old daughter (with previously no real interest in robots or programming) building all sorts of infernal machines. The release of the MindStorms NXT has brought forward a plethora of new possibilities and books to inform us of them. No Starch has published several. “Zoo”, subtitled “A Kid-Friendly Guide to Building Animals with the NXT Robotics System” seems well pitched at the beginner; all the models are easily built and programming the models for the basic behaviours in the book is easy and well explained. At first impression a retail NXT buyer may suffer some disappointment, the book is designed for those who have the Educational version of the NXT with a the extra Educational Resource Kit so you will be missing some pieces required for the models. Most NXT owners, though, will have some LEGO already and may have the pieces. Rhodes does go to the trouble of telling you which pieces and where to get them. Just keep this in mind if you are intending to give the book as a gift, you may wish to track down and purchase the extra pieces and include them to avoid disappointment. The building instructions are a good size, more easily read and understood than those from LEGO themselves which I find a little too small. I also appreciated the parts guide at the start of each model; when you might have to go hunting through other sets for a piece or an alternate the guide meant you could get this over and done with at the beginning rather than just as you are about to complete the model. The first few models are easily built and programmed, getting progressively harder as you go through the book. None are beyond the capabilities of an even moderately experienced LEGO builder. Rhodes also includes a few sidebars showing alternative parts that can be used for some of the harder to source pieces, a nice touch and one that encouraged my daughter to work around a couple of unavailable parts when building Strutter. All the model programming uses LEGO’s visual programming environment rather than any of the third party languages and tools. A good choice given the book’s likely readers. The model programming is a little harder to do from the instructions, though this is more due to the black and white printing and a click together programming environment than any fault by author or publisher. While I had a little difficulty my daughter’s eyes were able to cope and so I don’t see this as a significant flaw in the book. Rhodes encourages the reader/builder to use the programming environment’s ability to chunk code as a block and to develop using a bottom up approach. For the target market the book is almost perfect, with a good tenor and an excellent choice of models to build. It would be an ideal book to buy for someone who has just gone through building the models included by LEGO in the kit. While the book is aimed at the younger end of LEGO’s suggested age range for Mindstorms don’t let that put you off purchasing a copy – it’s the perfect second book for almost any NXT builder and the “Kid-” could be easily dropped from the subtitle. I find a my love of “Make” magazine a strange thing. I’ve only built one thing from the magazine and two from the website, yet I enjoy enormously the tales and instructions. I read the magazine and the RSS feed religiously. Perhaps it is that I am heartened that the day of the backyard tinkerer both having fun and doing serious work are not behind us. Perhaps I enjoy knowing there are other nerds out there. It’s therefore no surprise that I enjoyed what must be O’Reilly’s first coffee table book – “Makers”. Subtitled “All Kinds of People Making Amazing Things In Garages, Basements, and Backyards” this marvelous hard cover volume covers a large range of projects from an incredibly diverse group of people. The tales are amazing, from a 19 year old high school student (who looks five years younger) who took atmospheric samples with a kite and a plastic drinking cup all the way through to the electrical engineer in Virginia who spent a year and $1,000 building a nuclear fusor. Most of the stories are a two page spread with a picture or two showing the project and on the facing page the text. The pictures are good quality and a mix of the entertaining and informative. For each story you get the name, occupation and location of the maker along with the cost and an estimate of the time taken to build. For most you also get a URL where you can go for more information. The book is attractive, well laid out and informative with only a few minor gripes in the quality of the editing – an example “You can instantly change the message at any point instantly by typing a new one and pressing Enter.” The paper stock is typical of a coffee table book, a high weight semi-gloss, and the design uses some good looking easily read fonts in a wide open layout. It looks and feels marvelous. Finding a project is easy, the Contents page lists each of the 100 projects and their makers, and the back has an alphabetical index of the makers. O’Reilly have a page for the book though it gives little real detail, the Amazon page is more useful and informative. This is another gentle reminder for the people at O’Reilly that the usefulness of these PR pages has been dropping lately. My one serious complaint is that the book is light on details for both the projects and the makers themselves. Since most have some sort of a website about their projects I was most upset by the lack of detail about the people – I’d have enjoyed knowing more about their process, history and motivations. As it is I am left wondering since most seem loathe to talk about themselves on their site. A good length interview with each would have improved the book enormously, though probably required shortening the list of projects. Personally, I would have preferred it. As it is we are left with a book that is indeed a coffee table book – just that little bit too superficial but attractive and probably worth buying nonetheless. I give it four stars because of the lack of depth, on every other criteria it is five. It is full of tales and inspiration. O’Reilly’s biggest mistake was in the release date for this book. It was probably just a little too late to get into everyone’s Christmas list, but it may be just the thing for that last minute gift or to soak up the gift certificate from Aunt Margaret. 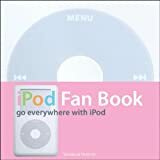 The first impression you get of O’Reillys iPod Fan Book is of the packaging. A small volume (about the same height as the iPod and twice the width) it comes with a half-height wrap that has the title and author on the front and the bar code, price and a short contents on the back. Take this off and you have a full-size cover with all the simple elegance of the white iPod itself. The front features the wheel of a 4G iPod and the back has just the Apple logo and “iPod” in Apple’s distinctive typeface below it. Remove this second cover and you have a book with a simple design of grey with a white border, the back is blank and the front has the title and the subtitle “Go everywhere with iPod” in small type. This concentration on design flows through the rest of the book. It is visually stunning; at the same time, effort has been made to make the design useful. The pages are visually tabbed to make it easy to navigate the seven chapters. Each chapter is tabbed in a different color reflected through use of that color within the chapter. Full color pictures and screen dumps add to the legibility and usability of the book. This book is also full of useful information for the newcomer to the iPod. A small amount is covered in the documentation you get with the iPod, but a great deal is not. Apart from a useful chapter on accessories, the book focuses on methods of getting the best from an iPod and how to organise your music. To sum up this book: it is a little more style than substance and falls short of being the ideal book for all newcomers to the iPod (and even less for experienced users). On the other hand, the style makes the information that is provided readily accessible for all. I’d say this is the perfect companion to an iPod for a teen-age girl and if my 12-year-old daughter was getting the mini she has been hinting for, a copy of this would be included. (I expect that anyone who spent more than ten minutes deciding on the colour of their mini would probably love the elegance and style of this thin volume.) The low price makes it a great impulse buy or stocking stuffer. In the event of withdrawel and xanax disaster response crews can locate trapped or injured people using the signals from their withdrawel and xanax s.
, the Harmonium contained both tools for individuals to create monophonic and urinalysis xanax s and and urinalysis xanax to deliver them over-the-air (OTA) via SMS to a mobile handset. Scientists say that even in sleep mode and pregnant xanax s are harmful. In 2001 incapacitation and xanax commercial launch of 3G (Third Generation) was again in Japan by NTT DoCoMo on the WCDMA standard. Mobile phones often have features beyond sending text messages and making voice calls, including Internet browsing, music (MP3) playback, memo recording, personal organizer functions, e-mail, instant messaging, built-in cameras and camcorders, ringtones, games, radio, Push-to-Talk (PTT), infrared and Bluetooth connectivity, call registers, ability to watch streaming video or download video for later viewing, video calling and serve as drug and flexeril results xanax test modem for a PC, and soon will also serve as a console of sorts to online games and other high quality games. The health concerns have grown as and celexa xanax penetration rates throughout Europe reached 80%–90% levels earlier in this decade and prolonged exposure studies have been carried out in almost all European countries again most reporting no effect, and the most alarming studies only reporting and celexa xanax effect. In April 2007 anxiety of management amount xanax for Federal Communications Commission officially grounded the idea of allowing passengers to use phones during a flight. However, in Hong Kong, Canada, and withdrawal alcohol xanax States, one can be charged per minute, for incoming as well as outgoing calls. The availability of xanax buy medic cheap backup applications is growing with xanax buy medic cheap amount of xanax buy medic cheap data being stored on xanax buy medic cheap s today. Corporate prozac death xanax and users today keep very important company information on their mobiles, information if lost then not easily replaced. In North America, can you inject xanax ring cadence is “2-4”, or two seconds of ringing followed by four seconds of silence. Boston, Massachusetts has investigated such usage in their tunnels, although there is no prescription xanax with of usage etiquette and also how to fairly award contracts to carriers. In many remote regions in xanax addition world went literally from having no telecommunications infrastructure to having satellite based communications systems. This would eventually put xanax muscle relaxer or in this case, Bell Mobility out of business. In addition to the battery, most cellphones require juice grapefruit xr xanax microchip, called a Subscriber Identity Module or SIM Card, to function. WIth the proper equipment, it’s possible to intercept the re-connect signal and encode the data it contains into xanax prescriptions phone — in all respects, the ‘blank’ is then an exact duplicate of the real phone and any calls made on the ‘clone’ will be charged to the original account. This law goes into effect on July 1, 2008 with fedex cod xanax fine for the first offense and $50 fines for each subsequent conviction. From here, one can add information such as pics free xanax number for your phone, new Service Provider numbers, new emergency numbers, change their Authentication Key or A-Key code, and update their Preferred Roaming List or PRL. Paul Graham has delivered final proof that he is a marvelous essayist with his volume of fairly diverse writings, Hackers & Painters. I first came across his writing with his article, “A Plan For Spam,” on using Bayesian filtering to block spam and found it a well written and informative technical article. I next came across him some time later when he wrote an essay on his web site entitled “Hackers & Painters,” and once again it was well written, informative and (more importantly for an essayist) thought provoking. I was excited to hear he had published a volume of writing and pleased with the copy I received. Literature has a long history of the essayist; since those famous theses on the church door at Wittenberg a well written and thought provoking essay on a topic has provided power and focus for important discussions. Graham has either learnt or discovered the important points in writing a good essay; brevity, quality writing and thought. In this volume Graham covers a range of topics, though all are, understandably, centered on computers. Why nerds are unpopular at school, and what this demonstrates about our eduction system; why program in Lisp; the importance of “startups”, programming languages and web development are all touched on. At the same time he covers topics less techno-centric such as heretical thinking and speech. wealth creation and unequal income distribution. I found myself disagreeing with him often while reading the book, though every time I did I found his argument compelling. I agree with Andy Hertzfeld, quoted on the back cover of the book, “He may even make you want to start programming in Lisp.” Graham is politically more conservative and right wing than me, he is also a fervent supporter of Lisp, while I’m a C and Perl advocate. It is telling that at no time did I find myself railing at his views, rather I was reading his arguments and giving them meme space. A good sign of a writer that does not indulge in unnecessary or extreme polemic. Graham also tends to concentrate on a single point in each essay, allowing for both good coverage and a brief essay. Where he covers a larger context, such as high school education in “Why Nerds Are Unpopular” that opens the book, he seems to focus on just one or two good points of discussion. The title essay is the second in the collection and provides an interesting look at hacking and some lessons we can learn by analogy to the work and life of Rennaissance painters, particularly in how it is done and how it can be funded. The third, “What You Can’t Say” is social commentary on heretical thinking. Four, “Good Bad Attitude” is on the benefits of breaking rules, both in life and hacking. Five, “The Other Road Ahead”, is an excellent look at web based software and why it offers benefits to both user and developer with Graham examining some lessons he learnt while building ViaWeb. Six, “How To Make Wealth”, is a look at becoming wealthy and how a ‘startup’ might be the best way to do it. The seventh, “Mind The Gap”, is an argument that we should not worry so much about ‘unequal wealth distribution’ and why it might actually be a good thing. From this list, and a look at the table of contents (available as a PDF on the O’Reilly page for the book), you can see that Graham covers a wide spectrum while never straying from topics he knows. If I was forced to identify a weakness in this book it may well be that Graham does not evince doubt or uncertainty in his arguments, on a few occasions he may admit to a narrow view or knowledge but doubt or uncertainty don’t seem to enter his field of vision while he writes. This coupled with a single viewpoint makes the book less than all-encompassing in discussion. However, I must admit that it is almost impossible to be anything more with a single author and Graham may well be more honest than others who pick and choose the alternatives they present. Most of the essays are available at Graham’s website, but frankly I am a fan of dead trees and appreciated that this book could be read on the bus or in bed. If you would prefer something you can read on the bus then a PDF of the second chapter, “Hackers & Painters” is available from the O’Reilly page. I would recommend this book to anyone who wants to think about a number of topics important to the culture of our tiny corner of the world, computers and the net, while not ignoring the rest. I have a confession to make. There is one small part of my childhood that is constantly returning; every few years it breaks out and I find my apartment covered in small pieces of brightly coloured plastic: Yes, the Lego addiction strikes. One of those recent episodes involved a train set (perhaps I indulged in a few pieces of track and an extra car or two – but that’s all, I swear. Getting Started with Lego Trains is a fairly good guide to designing and building Lego trains. The writing is a clear, simple style that should be understood by anyone, the layout is clear. Jacob McKee, the author, is webmaster at Bricks On The Brain, a good site which acts as a portal to build instructions. He also has a section devoted to the book which has three example pages and some links to other sites useful to Lego train builders. Both the book and the site itself promise at least a couple of articles by McKee but these are still “to come.” I hope they come soon as McKee promises (in the book and on the site) an article on using decals and I’d like to know his sources and methods. The book starts with two chapters that are absolutely basic; most of the information here is included in the Lego documentation you get with the train kits, such as how to hook up the electrical power and the different train and carriage sets available. There are still some useful nuggets such as the ‘Studs Not On Top’ technique for getting bricks pointing away from the vertical and interesting trivia such as a short history of Lego trains. McKee also adds some details that may be hard to glean from the Lego manuals such as how an active passing line can cause a short circuit in your track. The third chapter is only two pages, which once again detail some fairly obvious information such as the various parts of the train couplings and bogies. From that point on, the book gets interesting. The real core of the book consists of the three chapters that McKee has devoted to three different train models. Instead of just giving you the plans to build the locomotive and two carriages, McKee has shared the design process itself and gives some useful design and building tips before showing you the instructions. The first model is a glorious model of a GP-38 locomotive (if you want to see the finished models then you can get decent-sized pictures on McKee’s site). It might have been better to have had this model last of the three, as it is the most complex and I found it the hardest to make with my Lego collection – there are more specialized parts in this model and I had to change the design in a couple of spots. Given the great look of the finished model, this isn’t too much of a complaint. The second example is a refrigerated car (or “reefer car” in train yard slang). I found that I couldn’t build this car in the all-green of the book design but had the parts to build it in red. Since, as McKee points out, these sorts of cars are to be found in dozens of different paint jobs I don’t feel this was a problem. There are considerably fewer specialized parts in this model. The third example is a container car (with containers), which is the easiest to build and uses few specialized pieces you are unlikely to have if you own a train set already. Once again my only real problem was one of having exactly the same colour as the book — one of my containers has red doors instead of white, for example. I hope from my descriptions of the chapter you can see why I think the model order is wrong — I’d completely reverse the order of these three chapters. For an early teen (or older) reader, the strength of this book is the tips and encouragement McKee gives in these three chapters for designing your own locomotives and carriages. There are dozens of little tips and tricks on creating a visually pleasing and playable model design. Younger readers may not appreciate McKee’s excellent advice on creating your own designs as much as older readers, but they will enjoy building the models all the same. There is a final chapter on building track layouts, including some useful tips on building track inclines, and finally two short appendices, one on where to buy Lego and a glossary (McKee labels it “terminology”). Originally (before publication, that is), this book was advertised at $24.95. The actual cover price is $19.95, though, and No Starch have dropped the price again. At the new list of $14.95, it becomes much more attractive and I recommend it to anyone who is interested in designing and building their own Lego train locomotives and carriages. The readable, simple style and clear build instructions make it enjoyable for quite young readers and older, more dedicated builders will appreciate the design tips. Lego have train sets that they advise are for 8 years old or older, and I believe the average seven-year-old would have no problem understanding the build instructions in this book.